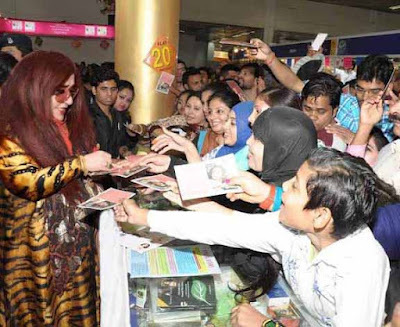 New Delhi : Indian beauty icon Shahnaz Husain visited India International Trade Fair 2015 being held at ITPO Pragati Maidan new delhi and provided free consultation on Falling Hair, Dandruff, Anti-ageing, Pigmentation, Scars, etc., at Hall number 12. She also launched her unique innovation, the Platinum Scalp Serum, which helps to control hair loss, promote hair growth and maintain the good health of the hair and scalp. She provided consultation to young ladies on winter beauty tips and how to use ayurvedic products available in their kitchen shelf and local gardens for enhancing their beauty. she also gave autographs and prescriptions to the young women on this occassion. A team of company officials are present at the Shahnaz Herbal stall to provide information on products and business enquiries. Indeed, every year, for more than a decade, the India International Trade Fair opens a wide window of opportunities for the Shahnaz Husain Group in terms of business development and trade.